Billie Lou Watt is known for her voice work in commercials and cartoons. She played Ellie Harper Bergman on Search For Tomorrow. Billie Lou Watt was a multi-talented lady of stage, television, and animation. With nearly 1,400 episodes of the CBS RADIO MYSTERY THEATER, it is unfortunate that she lent her voice to just one episode. Ms. Watt can be heard in many animated series such as ASTROBOY (as "Astroboy"), GIGANTOR (as "Jimmy Sparks"), KIMBA THE WHITE LION (as "KIMBA"), SUPERBOOK (as "Christopher Peeper"), THE FLYING HOUSE (as "Justin Casey"), and her recurring role in COURAGE THE COWARDLY DOG (as Eustice's mother, "Ma Bagge"), to name but a few; in each series, she would often voice multiple roles. As remembered as she may be to modern generations in these lead parts in cartoons (particularly dub work of Japanese series), Ms. Watt was an established stage actress who began in Broadway productions before her graduating from Northwestern University (where she met her husband, a star of OTR himself, Hal Studer). 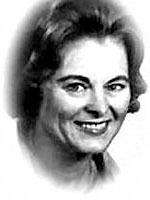 From the 1950s through the early 1980s, Watt would appear in different daytime serials with her longest run as "Ellie Harper Bergman" in CBS's SEARCH FOR TOMORROW, a role she played from 1968-1981. (Sadly, most of her footage from SEARCH was "wiped" as this was the period when many networks reused videotape to save money, not seeing their long-term value as entertainment in the future.) She spent her entire career in the NYC area, never "going west," and she died there of lung cancer in New York, New York, on September 7, 2011 (just four days before the tragic 9-11 events). Her contributions to entertainment will never be forgotten. Although she only appeared in one episode of the CBS RMT, today is Ms. Billie Lou Watt's birthday! As many of you may know, Watt was a very prolific actress of daytime TV, theater (Broadway and off Broadway productions), and animation. Her husband was OTR actor Hal Studer ("The Adventures of Frank Merriwell"). Billie Lou died in 2001, just a few days before 9/11. Very talented! She was best known as the voice of "ASTRO BOY". She worked on that series with OTR actors Ray Owens and Gil Mack! And, to a lesser extent, "KIMBA THE WHITE LION". Hal often voiced "Roger Ranger" as well. Hal joined the "team" with Kimba--as did Ray's wife, Sonia Owens. That team would occasionally work with Peter Fernandez's troupe, which included himself and Corinne Orr! I loved hearing Peter in cartoons and in radio (later SUSPENSE episodes, in particular, some of which he wrote!). They all had the same thing in common: Pablo Zavala and Sheldon Riss. They worked on "ASTRO BOY", "MARINE BOY", "SPEED RACER" (the latter two with Peter, Corinne, Jack Grimes and Jack Curtis). I do remember that after working on ASTROBOY (as a scriptwriter, not a voice actor) and GIGANTOR (as both a scriptwriter and voice actor), Fernandez wanted to branch out and not be tied down with Fred Ladd, which is how he ended up doing SPEED RACER and MARINE BOY on his own--and with Orr, Jack Grimes, Jack Curtis. n an audio interview I listened to, Fernandez was, understandably, a bit indignant that every ASTROBOY episode has "Written and Directed by Fred Ladd" on it when he stated that he himself wrote about 2/3 of the English-dub scripts. He said that he believed that Ladd only wrote the pilot and the other 1/3 of the episodes were written by "the voice cast," which was presumably Billie Lou Watt and Ray Owens. Keep in mind that Ladd's "Video Promotions" was the company that dubbed those episodes- and that he could assign credits when he wanted to---- or DIDN'T. I never saw Billie's, Ray's or Gil's credits at the end, either. After ASTROBOY, the actors DID get credited for voice work with Fred Ladd anyway...although not as script writers. Gil Mack wanted nothing to do with script writing though--which Fred would try to convince him to do. He told him something to the extent of "I'm an actor, not a writer," and that was that. By the 1980's, during the final season of the CBSRMT, Ray Owens was approached by CBN to work on a dub of two of their series: SUPERBOOK and THE FLYING HOUSE. Both are fun series in that many OTR actors also made guest appearances in both shows: Gil Mack (who was by 1982 in semi-retirement himself at age 70), Hal Studer (of course), Peter Fernandez, Corinne Orr, Bob Dryden (Yes! I caught his name on at least one episode of SUPERBOOK, season 2! ), Larry Robinson, Russell Horton, and others. Interesting radio connection: Billie Lou Watt played the radio character "Corliss Archer" when they made a stage play of it! Kimba - The original Lion King.